Intro/References: I will discuss the five main diagnostics from line ratios and continuum fluxes for H II regions that can be applied to other photoionized emission regions including active galactic nuclei, planetary nebulae, and any other emission line sources such as Wolf-Rayet stars, etc. For a more detailed description of photoionization modeling, statistical mechanics / thermodynamics, and quantum mechanics, please see Chapter 18 of Draine, this link (from which the summary and figures below are based), and the all-time best reference AGN2 : Astrophysics of Gaseous Nebulae and Active Galactic Nuclei 2nd Ed. by Osterbrock and Ferland. Motivation: Line ratios and relative continuum fluxes of photoionized emission regions can give much physical insight regarding the properties of the nebula and its vicinity including the amount and type of dust extinction along the line of sight, the number density, temperature, physical radius / volume, mass, and metallicity of the gas, and even the temperature of the ionizing source. These indicators may also give further clues as to the surrounding environment, including and certainly not limited to the star formation rate and history, metallicity and mass of the host stellar population / galaxy / AGN, and depletion rates and abundances of the dust and gas. where Case A and Case B represent the limits of two idealized situations so that actual H II regions must lie between these two extremes. Namely, Case A assumes the optically thin limit where hydrogen emission from all energy levels (Lyman, Balmer, etc.) can escape the H II region unabsorbed while Case B assumes all transitions more energetic than Lyα are absorbed and re-radiatved via Lyα and longer wavelengths. This is why the Hα emission line strength is greater in Case B. Nevertheless, the line ratios between Hβ and Hγ , for example, only vary by ~10% despite the temperature changing by a factor of two and not knowing in which optical depth regime the H II region exists. Thus, this Balmer decrement of decreasing relative line strengths toward more energetic transitions is fairly insensitive to temperature and number densities across the parameter space of H II regions. If the actual line strengths of an H II region are measured and since we know the theoretical Balmer decrement, we can infer the amount of dust reddening toward the H II region. If only two Balmer lines are measured, the amount of dust reddening along with a theoretical dust extinction curve can give us a dereddened spectrum corrected for dust extinction. Additional Balmer lines can be used to constrain the type and functional dependence on wavelength of the actual dust extinction. 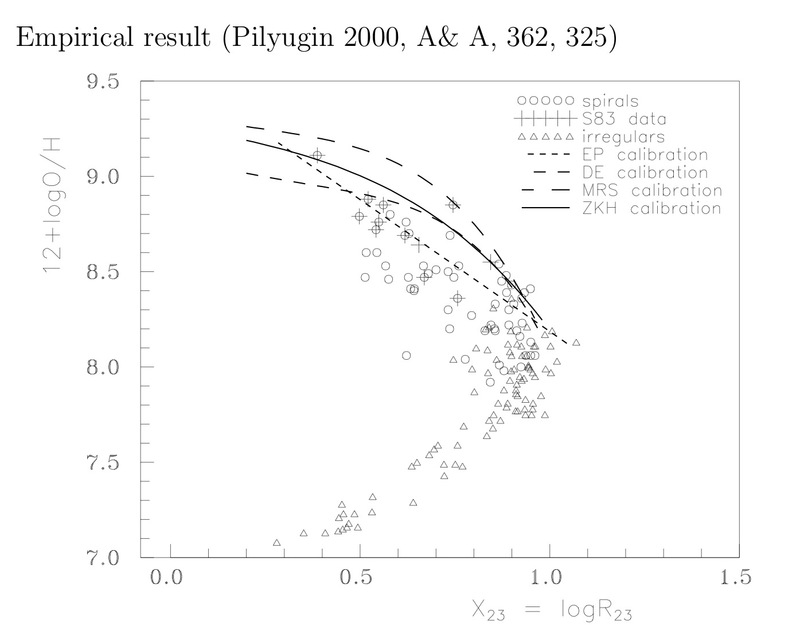 This information has its own merit for inferring the dust properties along the line of sight and possibly dust properties in the vicinity of the H II region itself, but perhaps more important it gives us corrected emission line strength ratios which can be used for other diagnostics (see below). The forbidden transitions of [OIII] and [S II] can serve as excellent diagnostics of both temperature and density of the gas. Theoretically, observations of [OII] and [NII] can also constrain these properties but in reality the transitions of [OII] are too closely spaced to be resolved while the [NII] lines are typically contaminated by Hα. Consider the energy diagrams of [OIII] and [S II] below, where you can see all the important listed transitions are forbidden due to violation of one or more of the selection rules of quantum mechanics: ΔL = ±2 (such as transitioning from a D state to S state or vice versa), ΔJ = ±2 (which is intrinsically tied to ΔL), and/or no change in parity πf = πi (both initial and final states in these cases have even parity). Obviously, these transitions are only forbidden to electric dipole radiation, and do occur in nature when densities are sufficiently low such that timescales of collisional deexcitation are longer than the lifetime before spontaneous decay via these forbidden transitions. Now consider the relative population of ions in the various electronic configurations and the measured transitions that arise from these upper energy levels. For example in [OIII], the ratio of the λ4363 to either or the sum of the λ4959, λ5007 intensities can allow you to infer the relative populations of the 1S0 to 1D2 states. Considering the energies between the two levels are widely spaced, the relative population will be almost completely dictated by the temperature of the gas, so the ratio of these [OIII] line intensities can be used to infer the temperature of the gas with only a slight dependence on number density. Conversely, the upper energy levels that give rise to the λ6716 and λ6731 transitions in [S II] are closely spaced in terms of energy so that the relative population will be controlled by collisional excitation / deexcitation between the two levels which depends significantly on the electron density. Thus, the relative intensities of these two transitions can be used to infer the number density of electrons. Combining observations of both pairs of transitions can further refine the precision of electron density and temperature via detailed photoionization modeling that relies on thermodynamic and quantum mechanical properties such as Boltzmann, Saha, Einstein A coefficients, collisional strengths and cross sections, and incident radiation. where as stated we already know the specified parameters on the right hand side. because we must make the assumption that we are in the optically thick regime, i.e. Case B, where all ionizing photons are absorbed within the HII region and reradiated at longer wavelengths. In the equation, f is the fraction of the flux of photons that are capable of ionizing hydrogen, and can be simply modeled while simultaneously fitting the temperature of the ionizing source T*. So to infer the temperature of the star, you must measure the broadband continuum V magnitude and know the response of the V filter with respect to frequency. You must also estimate the emissivity which you have already measured from the ratios of forbidden lines. Nevertheless, in all these input parameters you never had to assume the distance to the HII region, so the Zanstra temperature of the ionizing source is distance independent. Note that the relationship is double valued because of ionization and excitation effects. Nevertheless, observations of line ratios of other various ions can help constrain the abundances. Moreover, detailed photoionization modeling relying on the observed ratios of line intensities of the same ion can be used to derive the actual corrections for excitation and ionization. The Hubble image below shows the Orion A complex, which harbors two large HII regions, M43 to the Northeast (top left) the brighter Orion Nebula (M42, center). The HII region within the Orion Nebula is carved out by the Trapezium cluster, which is extremely dense (stellar density of 560 pc-3 – compare that with our local density of ~1 pc-3) and dominated by four stars, the brightest of which, θ1 Ori C (spectral type O7V), produces ~80% of the ionizing photons. M43 is ionized primarily by a single star, NU Ori (spectral type B0.5). The Orion A complex has been useful in understanding HII regions because of its proximity to us (~414 ± 7 pc), which allows its structure to be studied with high spatial resolution. The HII region within the Orion Nebula has broken out of the molecular cloud, creating a champagne flow. M42 has a particularly bright photodissociation region (PDR), known as the Orion Bar, which is visible to the Southeast of the Trapezium stars. The Orion Bar stands out as a bright ridge to the Southeast of the Trapezium cluster, but its prominence is actually a consequence of limb brightening, i.e. our peculiar viewing angle. The Orion Nebula is bounded on multiple sides by an ionization front, but we happen to see the bar edge-on, causing it to appear brighter. Fig. 3d from Felli et al. (1993). The Orion Bar is particularly prominent in this radio continuum map of the HII region of the Orion Nebula (20 cm, 6.2" resolution). The positions of several bright stars, including the four brightest Trapezium stars, are marked. The contours range from 95.0 to 300.7 mJy/beam. Felli et al. further demonstrate that the radio continuum emission correlates well with Hα emission, as we should expect. Bruce Draine (§28.2) calculates a maximum line-of-sight rms electron density of approximately 3200 cm-3 based on the Felli et al. (1993) peak emission measure (the integrated square of the electron density along the line of sight) of 5 × 10 cm-6 pc and an assumed diameter of 0.5 pc for the HII region. For an explanation of the emission measure, see this link or recall §5.3 of Rybicki & Lightman, which discusses free-free absorption. The basic idea is that the absorption coefficient due to free-free absorption is proportional to the product of the ion and electron densities. If the medium is neutral overall, then this is simply the square of the electron density, so the optical depth of an ionized cloud due to free-free absorption is proportional to the integrated square electron density. The progression of species refers to the progression of chemical species that dominate as one travels away from the HII region and into the molecular cloud. The key variable which changes along this path is the intensity of the UV flux. 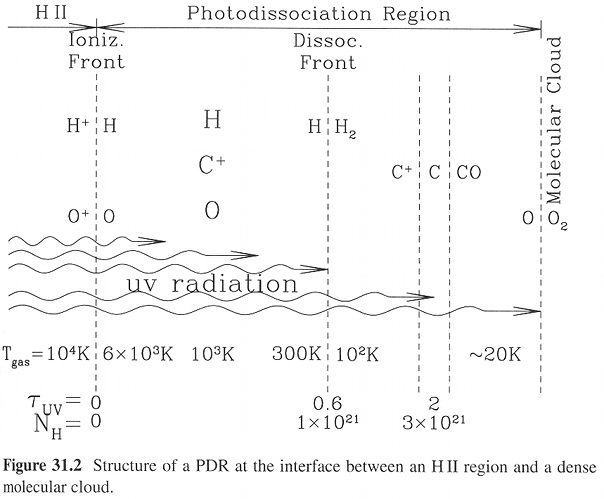 This has several effects: the ionized medium at first gives way to neutral atomic species, and deeper into the cloud molecules such as H2, CO, O2 and PAHs (polycyclic aromatic hydrocarbons) become stable; the temperature drops as the incident radiation becomes more attenuated (with increasing optical depth since the ionization front); assuming pressure balance, the density of the gas must increase into the cloud as the temperature drops. The assumption of pressure equilibrium is not exact, however, as HI flows from the dissociation front towards the ionization front. As this flow becomes smaller, the assumption of pressure balance and steady-state become more accurate. Figure 1 from Tielens et al. 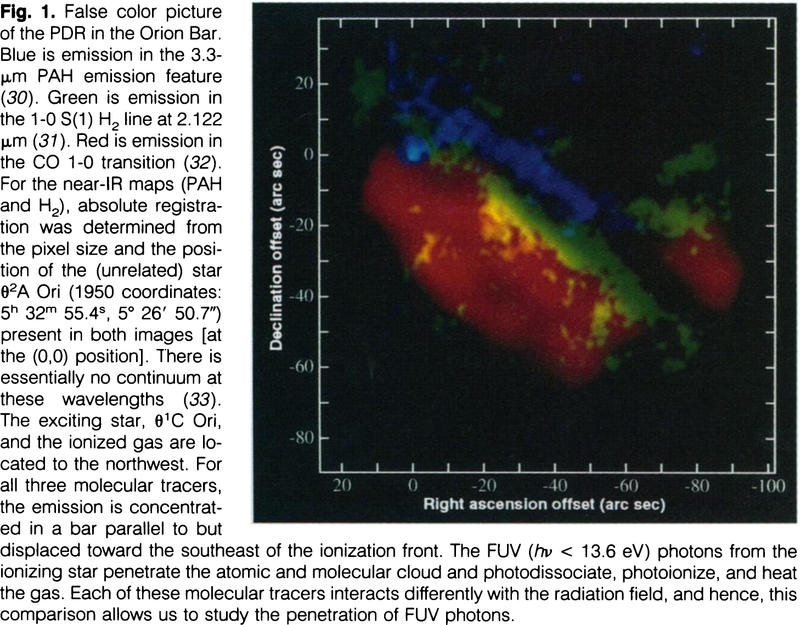 (1993) showing PAH emission (blue), 1-0 S(1) H2 emission (green) and the CO J=1-0 transition (red). The authors of the paper argue that the agreement between the modeled and observed emission features UV pumping as the mechanism driving excitation of CO and H2 ro-vibrational lines. As mentioned in the ESO link above, these lines are also observed in post-shock regions, where the gas has been collisionally excited. In order for the emission to be shock induced, however, the shock velocity would have to exceed 10 km/s, which would evaporate the bar on a timescale of 103 years. 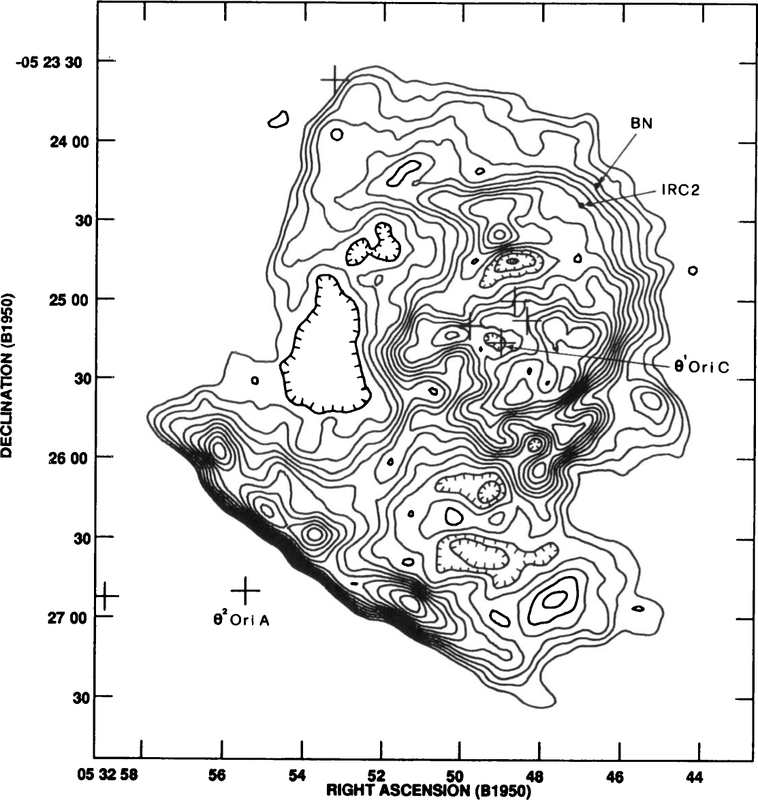 The authors also note that one weakness of their model is that it does not include clumping, which is likely to be important in the Orion Bar and traced by CO and CS maps. Finally, other molecular tracers, such as HCN, can be used to probe the denser regions of PDRs. Draine, Bruce T., Physics of the Interstellar and Intergalactic Medium. Princeton, NJ: Princeton University Press, 2011. Rybicki B.R., Lightman A.P, Radiative Processes in Astrophysics, 2nd Ed. Weinheim, Germany: Wiley-VCH Verlag, 2004.